Angiotensin-converting enzyme inhibitors (ACE-Is) are associated with angioedema, a potentially life-threatening adverse reaction. 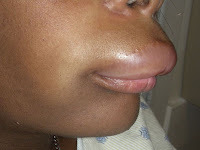 A 5-year medical record review included all patients seen with angioedema at a community hospital ED. Community hospital admission rates for AIIA were 14%- significantly lower than those from a tertiary care study (41%). Lack of urticaria or itching may help differentiate AIIA from allergic reactions. Angiotensin-converting enzyme inhibitor-induced angioedema in a community hospital emergency department. Bluestein, Hazel M.; Hoover, Todd A.; Banerji, Aleena S.; Camargo, Carlos A.; Reshef, Avner; Herscu, Paul. Annals of Allergy, Asthma and Immunology, Volume 103, Number 6, December 2009 , pp. 502-507(6). The photographed patient gave a permission for her photograph be taken and used for medical education.